mybe a bottle of wine or a glass of our homemade Sangria? Oh.... you are not drinking alcoholics. Try one of our natural juice or do you go for a milk-shake? 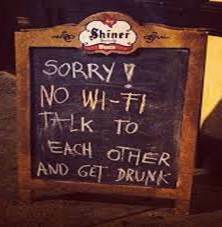 We have WiFi, but we like that phrase.